This book chapter higlights a new direction of Atangana–Baleanu fractional derivative to channel flow of non-Newtonian fluids. Because the idea to apply fractional derivatives with Mittag-Leffler kernel is a quite new direction for non-Newtonian fluids when flow is in a parallel plate channel. 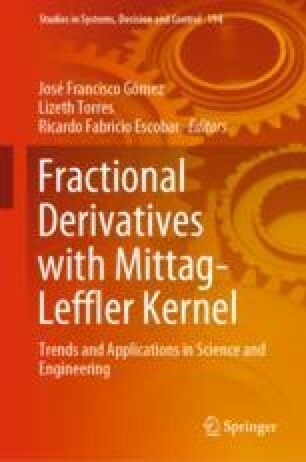 This new and inreresting fractional derivative launched by Atangana and Baleanu with a new fractional operator namely, Atangana–Baleanu fractional operator with Mittag-Leffler function as the kernel of integration has attracted the interest of the researchers. Because this new operator is an efficient tool to model complex and real-world problems. Therefore, this chapter deals with modeling and solution of generalized magnetohydrodynamic (MHD) flow of Casson fluid in a microchannel. The microchannel is taken of infinite length in the vertical direction and of finite width in the horizontal direction. The flow is modeled in terms of a set of partial differential equations involving Atangana–Baleanu time fractional operator with physical initial and boundary conditions. The partial differential equations are transformed to ordinary differential equations via fractional Laplace transformation and solved for exact solutions. To explore the physical significance of various pertinent parameters, the solutions are numerically computed and plotted in different graphs with a physical explanation. The results obtained here may have useful industrial and engineering applications. The authors would like to acknowledge Ministry of Higher Education (MOHE) and Research Management Centre-UTM, Universiti Teknologi Malaysia UTM for the financial support through vote numbers 15H80 and 13H74 for this research.